Did U.S. Make Statement in Tuesday’s World Cup Qualifying Win? 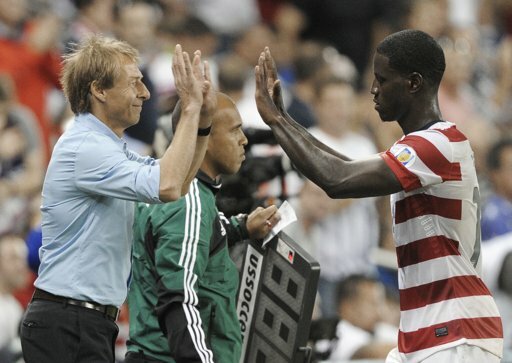 Mission accomplished: Back from the wilderness striker Eddie Johnson and U.S. coach Jurgen Klinsmann congratulate each other on a job well done after the win over Guatemala (AP Photo). KANSAS CITY, Kan. (AP) — The primary objective for the United States against Guatemala was a win or at worst a draw, and squeaking through to the next round of World Cup qualifying. It wasn’t the only goal. Jurgen Klinsmann revealed a much more ruthless motive in Tuesday night’s 3-1 victory that allowed the U.S. to win Group A and advance to the six-team finals in North and Central America and the Caribbean: The second-year manager wanted to send a message to the rest of the world. “With every game you try to earn respect. It’s what you do,” Klinsmann said. “Quite frankly, every qualifying game and every competition you try always to earn respect. It hasn’t always been pretty so far, but the pugnacious attitude of Klinsmann finally appears to have seeped into the psyche of a U.S. team drilled in defense by former coach Bob Bradley. Even when Guatemala charged to a 1-0 lead in the opening minutes on a defensive breakdown by the American back line, it only seemed to stoke their passion. They answered a few minutes later when Graham Zusi’s corner kick was redirected by Clint Dempsey and to the waiting foot of Carlos Bocanegra, who tapped it in for the equalizer. The U.S. quickly increased the pressure from there. his second goal of the game. Jr. to keep the game reasonably close. Not close enough for Guatemala, though. Jamaica’s 4-1 victory of Antigua and Barbuda allowed it to squeeze into the final round on goal differential along with the Americans. They’ll be joined by heavily favored Mexico, Costa Rica, Honduras and Panama. Klinsmann called the next round a “grind,” 10 matches beginning in late March that will set the field for the 2014 World Cup in Brazil interspersed throughout a busy year. The American team will have several friendlies scheduled to tune up for their international matches, and also have to balance a roster for the Gold Cup, which runs from July 7-28. The U.S. advanced through the group stage of the regional championship last year with a 2-1-0 record, and defeated Jamaica 2-0 and Panama 1-0 to reach the final against Mexico, which it lost 4-2 to the Rose Bowl in Pasadena — a defeat that in part led to Bradley’s ouster. Klinsmann acknowledged it’s not an easy puzzle to solve, but it’s a welcome one. at Jamaica and a narrow win last Friday in Antigua that kept the Americans off the brink of failing to qualify for the World Cup. Now, it’s a matter of finding out which guys in Klinsmann’s pool best fit together, and making sure the confidence gained Friday night only builds heading into a busy 2013 schedule.